Tapachula de Córdova y Ordóñez, simply known as Tapachula, is a city and municipality located in the far southwest of the state of Chiapas in Mexico, near the Guatemalan border and the Pacific Ocean. As of 2010, the municipality had a total population of 320,451. It is one of the most important cities of Chiapas economically as the capital of the agriculturally rich Soconusco region as well as port for trade between Mexico and Central America. The area was originally inhabited by the Mames as a region under the control of the Mame state of Xelaju but was first established as a city by the Aztecs in the 13th century. Most of its economic importance has come since the late 19th century with the establishment of coffee plantations. This agricultural production began a history of migration into the area which continues to this day and has left the city with a significant Asian and German cultural presence as well as large Mayan and Nahua indigenous populations. The municipality stretches over a section of the Sierra Madre de Chiapas and west onto the coastal plain to the Pacific with an average altitude of 170 meters above sea level. The main ecosystems in the municipality include low growth rainforest, medium growth rainforest and oak-pine forests. Many of these forest areas have been over exploited with significant loss of both plant and animal life. Ecological reserves include El Cabildo-Amatán, El Gancho-Murillo and part of the Tacaná Volcano. The climate varies by altitude from hot in the low coastal areas to temperate in the higher elevations. There is a small area with a cold climate as part of the Tacaná Volcano. Precipitation also varies by altitude. The climate of the city area is hot and humid most of the year. The area is one of the rainiest in the world with annual rainfall of about 3,900mm drained by a number of rivers and streams that flow from the Sierra Madre de Chiapas over the coastal plain to the Pacific Ocean. The main rivers are the Huehuetán, the Coatán and the Cuilco. There are eighty-two communities considered to be at high risk to natural disasters due to flooding of rivers and insufficient roadways to evacuate. Fifty-two of these located on riverbanks of three rivers: Coatán, Texcuyuapan and Cahoacán. Much of the flood control of the area was damaged or destroyed by Hurricane Stan in 2005. Because of its proximity to neighboring Guatemala, the Tapachula area has absorbed a number of ethnicities from this country but the main indigenous group remains the Mame. About sixty three percent of the municipality’s population is Catholic with about 19 percent professing some other type of Christianity. Most of the rest state that they have no faith. This is about average for the state. The city of Tapachula is capital of the Chiapas region of Soconusco with the nickname of the “pearl of the Soconusco”. The name “Tapachula” comes from Nahuatl and means “between the waters” due to the area’s frequent flooding. It is located on a low-lying coastal plain with various small rivers about 120 meters above sea level. The name comes from the Nahuatl phrase “Tapachollan” which means ”between the waters”. The official name of the city was changed to “Tapachula de Córdova y Ordóñez” in 1997 in honor to priest Fray Matías de Córdova y Ordóñez. The first people to settle in the area migrated from the south in Central America and most likely are the ancestors of today’s Mame people. The Olmecs dominated the area, driving many Mames to migrate back south. The Toltecs arrived next but never completely subjugated the native peoples. However, these conquests resulted in the Mames never developing major civilization. The city of Tapachula was founded as a tribute collection center for the Aztecs in1486 by a military leader named Tiltototl, sent by Ahuziotl to conquer the Soconusco. The Soconusco region has produced cacao since 2000 BC. After the Spanish conquest, it was administered under the Kingdom of Guatemala. This region was larger than it is today, with the very south of the old extension now part of Guatemala. As such, Tapachula became a border area, first among the Spanish colonial authorities of New Spain, Chiapas and the Captaincy General of Guatemala. For example, when the Diocese of Chiapas was created in 1539, it included the Tapachula area. However, the Soconusco region had political differences with all of these authorities at one time or another. Tapachula became the capital of Soconusco region in 1794, replacing Escuintla. In 1809, shortly before the start of the Mexican War of Independence, Tapachula protested the high rate of taxation to Spanish authorities to no avail. During the war, it was officially declared a town in 1813, and a parish in 1818, with the San Agustín parish church established in 1819. At the end of the war, Tapachula, as capital of the Soconusco, declared its own independence from Spain and Guatemala in 1821, and away from Mexico in 1824. However, for most of the rest of the 19th century, the Soconusco would be disputed territory between Mexico (as part of Chiapas) and Guatemala, until a final border was drawn between the two countries in 1888. In the meantime, Mexican president Antonio López de Santa Anna declared Tapachula a city as he fought to force the region back under Mexican control. The city was occupied by French troops during the French Intervention in Mexico until 1865 when they were expelled by Sebastián Escobar. The current municipality was created in 1915, with Tapachula as the governing entity. It was declared the provisional capital of Chiapas by forces loyal to Victoriano Huerta in 1924. The first air route to the city was established in 1929, connecting it with Tuxtla Gutiérrez and Mexico City. Tapachula became a diocese separate from Chiapas in 1957 covering the entire Chiapas coast area. It was reaffirmed as the capital of the Soconusco region in 1983. In 1984, a coat of arms was chosen for the city, designed by Edgar José Cabrera Arriaga. The growth of the city and its economy has presented problems in the early 21st century. The city during this time has grown outward, surrounding industrial structures such as petroleum storage facilities belonging to PEMEX and a terminal of the Chiapas-Mayab railroad. This raised questions of safety until both were moved further outside of the city limits in 2011 (PEMEX is still inside the city, it’s never been moved outside of the city). Tapachula is Mexico’s main border city with Guatemala on the Pacific coast area even though it is located some kilometers away from the border proper. The main commercial border crossing is in Ciudad Hidalgo about forty kilometers away. Nonetheless it is the principal port for the crossing of goods and people between Mexico and Central America, making it economically and socially similar to cities on the US southern border such as Laredo, Texas. The flow of goods through the area as well as being the economic center of the rich agricultural region of the Soconusco, makes Tapachula one of the most important economically for Chiapas with one of the highest per capita incomes in the state. As its wealth is relatively recent, since the late 19th century, Tapachula is mostly a modern city. Like border cities in the United States, Tapachula and other communities in the area have problems with illegal immigration, drug traffic and violence, with most of the illegal border crossers coming from Central America. This has led to a strong and very visible police presence in the city along with special security measures for major events such as the Feria Internacional Tapachula. The city has had a strong Chinese presence since around 1900, when a number of people from China came to work in the coffee plantations of the area. Most of the descendents of these first immigrants have since dispersed throughout the Soconusco region, but there is still Asian immigration to Tapachula to this day. Most modern immigrants work in commerce rather than in agriculture. The most visible evidence of Asian presence is the significant number of Chinese and other Asian restaurants in the city, especially in the downtown. A number of businesses selling Chinese food and imported items are concentrated in the San Juan market. The Casa de la Comunidad China (Chinese Community House) is located Cuarta Avenida Sur. The structure is dedicated to education about Chinese culture and was reopened in 2012 after renovations. Tapachula signed a sister city agreement with Dongying, China in 2011. Most of the city’s monumental structures in the historic center were built in the first decades of the 20th century, although there are a number of significant large homes near this same area built in the 1960s in Art Deco style such as the La Portaviandas building. Outside the city downtown, the structures just about all date from the latter 20th century on due to recent growth. The historic center is marked by a large, tree-lined plaza called Parque Miguel Hidalgo. The center of this plaza contains an octagon kiosk with Baroque ironwork with some Moorish influence. Parque Miguel Hidalgo is the center of the city surrounded by the old and new municipal palaces, the Perez Porta and the Teatro al Aire Libre (Open Air Theater), which often has marimba concerts. 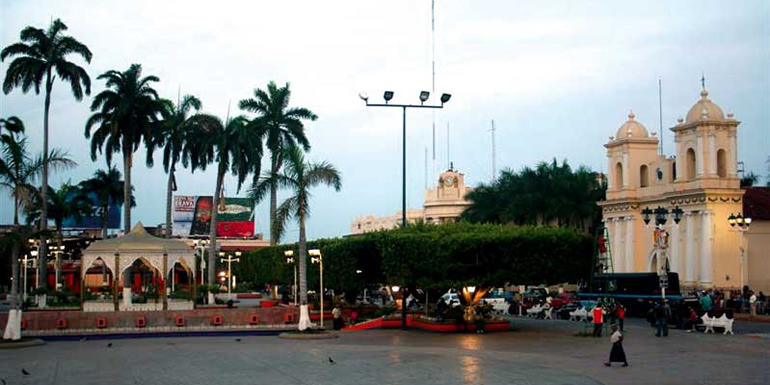 The main monumental buildings of the area surround this plaza and include the old and new municipal palaces, the Perez Portal and the Teatro al Aire Libre (Open Air Theater). The San Agustín parish church dates from the 18th century, established to honor the patron saint of the city, Augustine. It is a simple construction with a red Spanish tile roof, supported by wood beams. The facade is a simple Neoclassical with six Ionic order columns, three on each side of the entrance, joined by false arches. The top of the facade has two bell towers. This design is based on the Teopisca church. The church became a cathedral in 1958, shortly after the Tapachula diocese was established but that status has since been ceded to the San José Cathedral, consecrated in 2009. The Soconusco Archeological Museum faces Parque Hidalgo. This building houses a number of pieces from the various archeological sites of the region, especially Izapa and several coastal sites. One special piece is a skull covered in gold and incrusted with turquoise. Another is a stele called Number 25, because of the quality of its engravings. The Casa de Cultura was built in 1929 as the municipal palace when the city was prosperous because of the surrounding coffee plantations. Although the style is Art Deco, the facade is decorated with Oaxacan style fretwork, images of Aztec warriors and stylized serpents along with the Mexican and state coats of arms. Today, the building functions as a cultural center for the city. The municipal cemetery is notable as a testament to the immigrant past of the area, with gravestones with German names and Chinese characters. The best examples of both date from the late 19th to early 20th century. One of Tapachula’s most famous natives is the actress and singer Bibi Gaytan, who first achieved stardom in the 1990s. The cuisine of the municipality varies greatly as the topography extends from the ocean into the mountains. Main annual events include Chinese New Year, San Benito, the Feria Tapachula, San Agustín, Jesús de la Buena Esperanza and San Miguel. There are 578.84 kilometers of highway most of which are rural roads maintained by state and federal authorities. The main highway in the area is Federal Highway 200 which follows the coastline of Chiapas.